Japan Powder Technology Forum within NNS 2013 and launching of Indonesian Powder Association | Electrochemistry & Corrosion Lab. 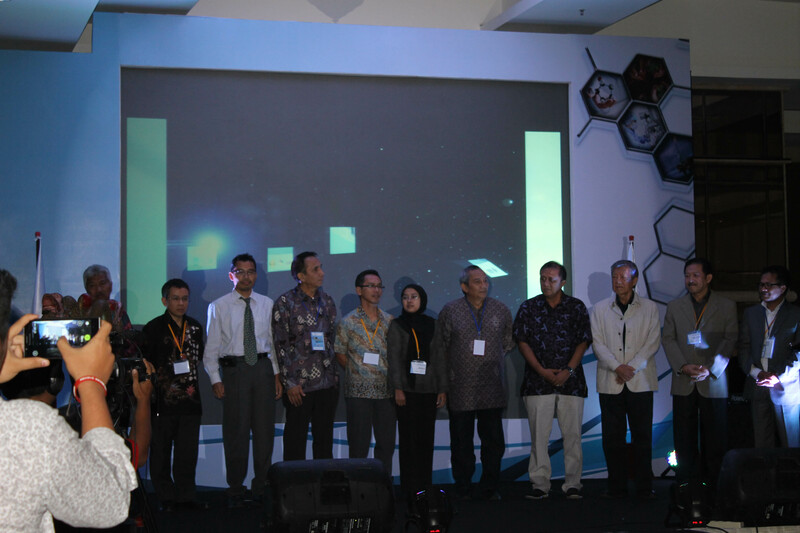 Within “the 5th Nanoscience and Nanotechnology Symposium (NNS 2013)” held by Study Center of Materials and Nanotechnology LPPM ITS on 23-25 October 2013 in Meritus hotel, Surabaya, the Department of Chemical Engineering ITS, cooperated with the Society of Powder Technology Japan, held “Japan Powder Technology Forum (JPTF 2013)”. Both NNS 2013 and JPTF 2013 were organized by our laboratory. The Forum was aimed to introduce the technological development related to powder/particle developed by Japanese companies to Indonesian companies/society. The program started at 13.00 p.m. and officially opened by Prof. T. Matsuyama, head of Kanto Section of the Society Powder Technology Japan. The forum was chaired by Prof. Wuled Lenggoro of Tokyo University of Agriculture and Technology. The first speaker for the first session was General Manager and CEO of Ohkawara Kakohki Co. Ltd., M. Osuga dan M. Ohkawara, respectively. They introduced spray dryer technology with twin jet nozzle. This technology has been applied at many industrial segments including food, pharmaceutical, organic chemistry, inorganic chemistry, industrial waste, advanced ceramics, etc. The presentation was continued by speech by CEO of Makino MFG Co. Ltd., T. Makino, who discussed about pulverizer to produce rice flour. They developed a machine, that although the raw materials have different characteristics but have the same quality of products. The first session was ended by the talk by S. Nagare, PhD. from Nara Machinery Co. Ltd. They introduced their developed technology to modify particle surface and composite materials by hybridization system. The second session was opened by a presentation about the application of industrial microwave on bulk solid handling processing by the president of Matsushima Machinery Laboratory Co. Ltd. One application of this technology is on the measurement of solid level in silo. The next presenter was president director of Nishimura Machine Works Co. Ltd. who talked about weighing and filling machine of powder. Then, president of Tokuju Co. presented about milling and classifying process. This session was closed with presentation by Dr. N. Aya of National Institute of Advanced Industrial Science and Technology who discussed about fine bubble technology and international standardization. The Forum was attended by representatives from 14 Indonesian companies, namely: PT. Petrokimia Gresik, PT. Pupuk Kalimantan Timur, PT. Molindo Raya, PT. Grafindo Nusantara, PT. Trans Sulawesi Tenggara, PT. Trans Sulawesi Sejahtera, PT. Trans Jawa Sulawesi, PT. Ultimate Carbometal Nusantara Dua, PT. Carbonindo Nusantara Jaya, PT. Gunung Sabak, PT. Wali Mining, PT. Latambaga Raya, PT. Lasolo Karya Sejahtera dan PT. Mekongga Sejahtera. Two companies run business on production of fertilizer and the others mostly on mining and minerals production. The participants were very enthusiast with the discussion demonstrated by many questions arised during discussion sessions. The forum was closed by the launching of Indonesian Powder Association to build better networking for developing powder technology. The association was established to answer the concern about the neglect of development of powder technology resulting natural resources and minerals spreading around the area of Indonesia exported in the form of raw materials without added value. To overcome the problem, Indonesian Powder Association was established to build networking and cooperation among industries, universities and research institution. It is expected that technology transfer from universities and research institution from fundamental and applied research will be implemented. The Department of Chemical Engineering ITS took an active role on establishing this association where one of its academic staff, Prof. Heru Setyawan, is head of international collaboration and has had collaboration with PT. Trans Jawa Sulawesi for developing magnesia processing. The organization of the Indonesian Powder Technology is in the following. * Research and Development Division: Dr. I Made Joni, M.Sc. There are 11 companies that have joined the Indonesian Powder Association as corporate members. The eleven companies are: PT. Grafindo Nusantara, PT. Trans Sulawesi Tenggara, PT Trans Sulawesi Sejahtera, PT Trans Jawa Sulawesi, PT. Ultimate Carbometal Nusantara Dua, PT Carbonindo Nusantara Jaya, PT Gunung Sabak, PT Wali Miniing, PT Latambaga Raya, PT Lasolo Karya Sejahtera and PT Mekongga Sejahtera. Most of the companies are on the mining and minerals business. We hope there will be more companies from various fields of business join this association in the near future to support and contribute to the development of Indonesia. This entry was posted in NEWS! and tagged chemical engineering, Indonesian Powder Association, its on October 27, 2013 by Admin. Pingback: Proceeding of NNS2013 has been published by AIP | Electrochemical Engineering Lab.